The Kensington Community Food Co-op was looking for an identity for their new food co-op that would distinguish themselves from competitors. They are committed to healthy neighborhood living. Their mission is to provide a grocery store in the Kensington area that will provide healthy, quality food, products and services to its members and the community. They encourage each member to contribute and participate in all activities they undertake as a cooperative. For this logo design, I first did research on trends in the industry and competitors. I realized that many trends included: fruits & vegetable visuals, produce, lots of sun, mountains and track imagery. Drop shadows and gradients were also very common among other food co-ops. All in all, the competition had one thing in common, there was too much going on, or nothing going on at all. And so, to improve upon competitors, I began mind-mapping for ideas. A few words I came across were community, neighborhood, shared values, togetherness, and helping. Out of these, I really wanted to choose something unique for KCFC's new logo. I decided on the idea of "neighborhoods," being in Philadelphia and all. I am always inspired by logo designs with hidden meanings, such as FedEx, Big Ten, Northwest Airlines, and Amazon logos. And so I really wanted to apply a hidden message in KCFC's new logo. 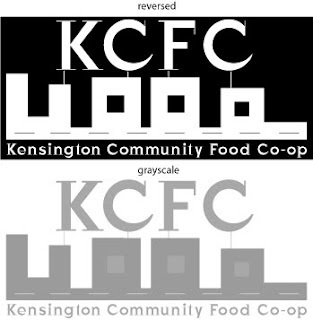 Above the logotype of Kensington Community Food Co-op is a road with square blocks that represent apartment buildings. Not only does it represent neighborhoods, but it also spells out the word Co-op. As for color selection, I chose a earthy green because I associate this color with freshness and growth. The choice of gray was because it compliments green really well as a neutral color. The typeface I chose is Bodoni. Bodoni is an elegant modern typeface that is also a classic. I thought that the serifs looked elegant, and helps for legibility as the flat serifs help to create a straight line under the words. It's important for a new brand to have a clear and easy to read type, and Bodoni does a great job. I feel that this logo design falls under those 5 principles.